Ooooh, fexcellent! 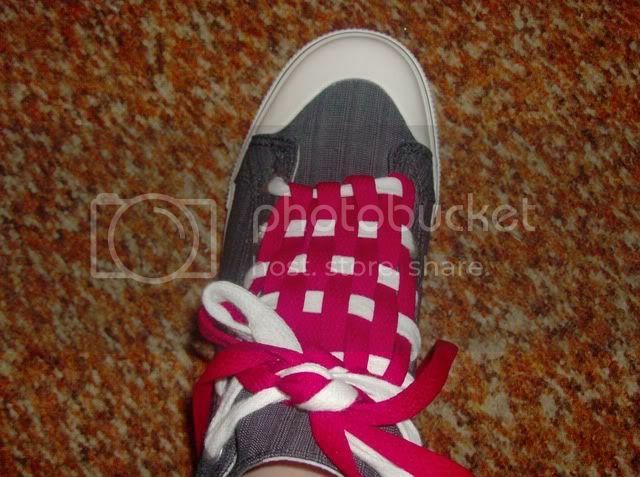 I tried to do that, but my little shoelace holes are too small to fit all of the loops. It took me about 2 hours for each shoe. Its a pain to get the laces through each hole. I was extremely bored and extremely determined to do it. Once I start something, I have to finish it otherwise I dont start anything else. I'm like with certain things. But I'm lazy when it comes to stuff like shoelaces. Shoelaces are my thing. Every pair of my shoes has either different style laces (not ones found on google) or they have different writing on them and such. Oooh fun. I have a thing for necklaces and rings. I own tons and wear them all the time. Nice! I have a pair of shoes with laces like that! Every pair of my shoes has different color/style laces. That's cool--What's your favorite brand of shoes?